One of the nicest things about The Great Escape festival in Brighton is that they actually celebrate local talent, in amongst the HAIMs and Oliver Tanks of the world. 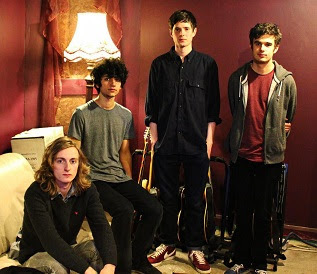 One such group of talented young chaps is Lovepark, whose origins lie in Burgess Hill, not too far from Brighton. Top melodic indie rock. We're pleased that Lovepark aren't afraid of a good melody. And we're not afraid of them. The band or melodies, that is. Born from the ashes of Puritans, this new incarnation has been quietly rising in stature, with recognition from the likes of Killing Moon Limited and Cruel Rhythm before their debut single drops, hopefully later this summer. In the meantime, you can do with a couple of their older demos, namely 'Almost As One' and 'Eager Jester', embedded below. The tracks are not too dissimilar from fellow Brighton area outfit Flashguns, which I suppose is handy seeing as they split up last year leaving a small sized gap in the market. Another Lovepark track, 'How Do I See?, can be found on their Soundcloud page.